rounded points, chrome over nickel plated, packaged in hang bag. 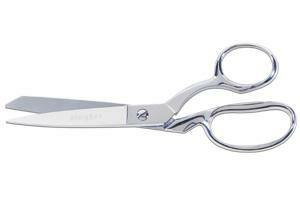 While these shears perform well on all fabrics, they are especially designed for working with filmy or silky fabrics - the micro-serrated edge helps to grip the fabric while cutting and the slightly blunted points will not snag silky fabrics. The knife edge ground on the other blade offers ease in cutting thick layers of fabric and can be easily sharpened using the sharpening stone. This item is very popular for use in clothing construction. These are great dressmaker scissors, overall, but they are excellent for cutting slinky and slippery fabric. One blade has a slightly serrated edge that seems to grip the fabric. The only reason I don't use them for all my cutting is that I don't want to get them dull--because I don't have the expertise in sharpening them.